We just celebrated the return of Pam, but we have yet another agent heading off for fresh research! In the next week Linda will tour Colombia’s cities and coffee plantations with some of our local partners. As a tourist destination, Colombia hasn’t always had the best reputation. However, due to improvements in infrastructure and security, the country is opening up—and there are plentiful vistas, cultural centers, and heritage sites for travelers to see. Over the weekend Linda boarded a flight to Miami, where she caught a connection to Bogota, the country’s charming capital. Bogota is a bustling city with 8 million people, a model mass transit system, and the world’s largest bicycling network. She was met upon arrival and escorted to the JW Marriot Bogota, an excellent 5 star-hotel located at the heart of the entertainment and financial district. Linda spent a fun and fast-paced Sunday inspecting the historic quarter of La Candelaria, the Gold Museum (with its El Dorado exhibits) and the art collections in the Fernando Botero Museum. 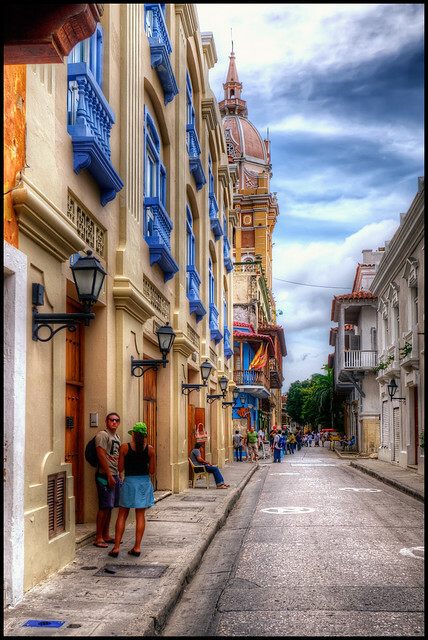 The district has retained its colonial houses and cobblestone streets that lead to its charm. After lunch, she took a cable car up to Montserrat and enjoyed panoramic vistas and a visit to a pilgrimage church. Visitors to Bogota can also visit the large botanical garden, the planetarium, the Catedral Primada, and the flea market at Usaquén. Today, Linda will also get to tour Zipaquira, about an hour north of Bogota. The town’s main tourist attraction is its Salt Cathedral, a church constructed almost entirely of salt that lies 200 meters underground. Stay tuned until Wednesday, when Linda will head over to the world-famous Coffee Triangle and beautiful Cartagena! Interested in visiting Colombia? Call us at 503.224.0180 or email info@wittravel.com. Ajiaco is the definitive dish from Bogota. It’s a heavy soup made up of chicken, three types of potatoes, corn, and the guascas herb. Said to have derived from the Taino word aji, or hot pepper, it covers a range of tasty regional variants. The stars of this show are the buttery papas Criollas, yellow and tender potatoes. You can substitute the herb for bay leaves and parsley and the golden papas for Yukon Golds. Garnish with a blend of sour cream and heavy cream, and serve with cilantro, capers and avocado (in soup or on the side). 1. Stick the chicken and a handful of quascas into a large stock pot, add water and bring to a boil. When the meat is tender, remove chicken and set aside in foil to keep warm. 2. Add the potatoes, bring to a boil, then reduce heat and simmer, covered, for 2-4 hours. The tiny yellows should start to break up in the soup—you can help this process along by mashing some of them. 3. Remove the skin and bones of the chicken. Cut the meat into small pieces and put them back into the pot. 4. About 5 minutes before serving, add remaining guascas. 5. Serve in deep bowls, making sure that each bowl gets some chicken and a piece of corn on the cob. Garnish and serve with rice.